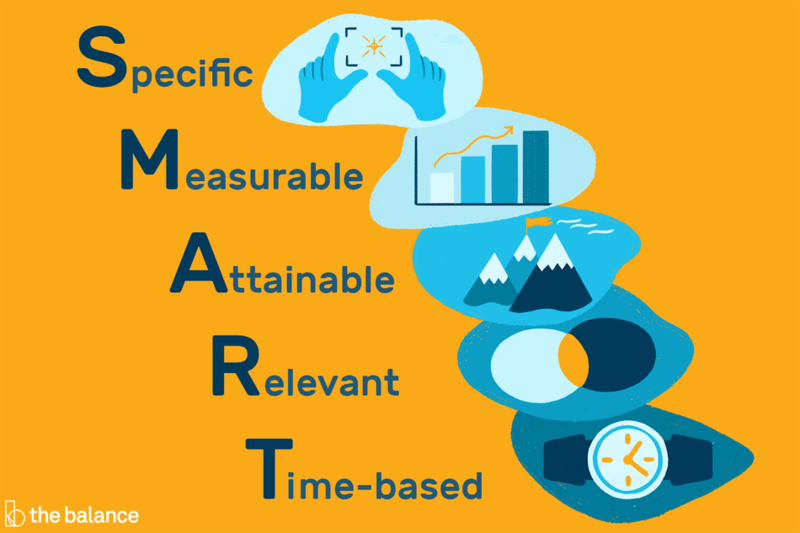 SMART goal setting, which stands for Specific, Measurable, Attainable, Relevant, and Time-Based, is an effective process for setting and achieving your business goals. As you review the sample SMART goals, notice how each example outlines several subgoals, or specific actions, that need to take place in order to accomplish the overall goal. Each of those smaller goals can be applied to the SMART criteria in the same way as shown here. Attainable: I will get set up on Etsy first. Then I will build an inventory of 30 handmade cards to sell. Finally, I will promote my business and build customer relationships through word-of-mouth, referrals, and local networking. Within a month, I am going to get set up to sell handmade cards on Etsy, which will allow me to benefit financially from my favorite hobby. Within six weeks, I will have an inventory of 30 handmade cards to sell and aim to sell a minimum of five cards per week, building customer relationships through word of mouth, referrals, and local networking. Measurable: I will measure my progress by how many new clients I bring on while maintaining my current client base. I will acquire three new clients for my consulting business within two months by asking for referrals, launching a social media marketing campaign, and networking with local businesses. This will allow me to grow my business and increase my revenue. Specific: I will write a book about social media that is a minimum of 150 pages. Measurable: I will write one chapter per month or three to five pages per week. In order to establish myself as an expert, I will write a 150-page book on social media by writing one chapter per month (or three to five pages per week). The book will be completed in 10 months, and then I will search for a publisher or explore self-publishing. Measurable: I will be successful if I am asked to speak publicly on the topic at least once a month, receive interview requests every week, and write one article per month for a top industry publication.